We got these for our Ring Bears. I think they will get use out of them. They look ok just not sure how they will actually hold up once put to use. I wish I could have put RingBear on the back or something is my only complaint. This was the perfect gift for the ring bearer. It was personnalized and can be kept as a nice souvenir. This is a great product. I am giving them to my Flower Girls and Ringbearer. The product arrived quickly and with no issues. The engraving is perfect. I know that the kids will love them. A keepsake you can have fun with- now that's my kind of gift! Q:I am a huge fan of yo-yos and am very interested in getting this product as wedding favors. But I want to know if the yo-yo "sleeps" (as in, can it do tricks; a yo-yo "sleeps" when it stays spinning at the bottom after you swing it down, rather than automatically returning to your hand). Thanks in advance! Boys will be boys. Even when they are dressed in tuxedos, your groomsmen are still just your best buddies and they will appreciate this playful gift as it takes them back to childhood days. 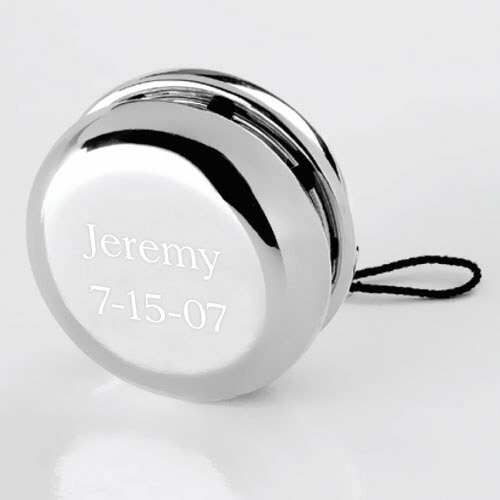 This snazzy silver plated yo-yo can be engraved with a name and a date or a custom inscription of your choice. It's the perfect keepsake for your attendants, ring bearers or ushers. Each mini yo-yo can be personalized with 2 lines of text with a limit of 15 characters per line (including spaces). Measures 2 inches in diameter and 1 inch in width.